Hakatai Classic Series glass tile blends is perfect for any art project. These assorted glass tile blends allow you to get a ready made blend of similar colors for shading on your craft glass tile mosaic projects. Choose from 11 stocked assorted glass tile blends, from red, orange, red glass tile to black, grey, white glass tile blends. For the craft project needing larger palette of colors the Rainbow glass tile blends have several differnet colors in each bag. 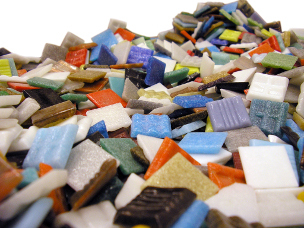 Available in a variety of glass tile color schemes and packaged in easy 1 lb. bags. These glass tile blends will allow to have multi colors in a 1 lb. bag, as opposed to 1 lb. of each color needed. Art glass tile and mosaic craft projects with glass tile can bring chararter and color to any project. Tile size: approx. 3/4" x 3/4"
Please note: Computer monitors vary in how they show color. Photographic lighting can also affect the look of tile. We strongly recommend ordering a sample sheet or swatch card before placing an order.